The Stanfield Tigers started off league action with a win over Irrigon. 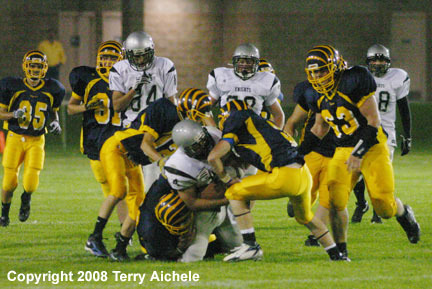 STANFIELD - The Stanfield Tigers defeated the Irrigon Knights 48-6 in 2A Blue Mountain League action on Friday night. The two teams went into the second quarter scoreless. At 6:53 mark Stanfield quarterback Quinton Grogan handed off to DJ Scott on a long run to the Irrigon two yard line. The Tigers punched it into the endzone on the next play and converted on the kick to take a 7-0 lead. Just over a minute later, at 5:26, Stanfield took possesion on the Irrigon 49 yard line. 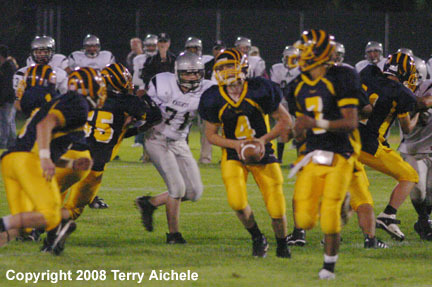 Josh Grabeel took the handoff forty yards to give the Tigers a first and goal on the nine. Two plays later, with 4:29 to go in the half, Grogan handed off to DJ Scott who ran it in for a touchdown. A fumbled snap kept the score 13-0. The Tigers took possession of the ball with 3:17 to go in the half on the Irrigon 48 yard line. Grogan dropped back and let loose a pass good for a touchdown. The two point attempt was not good. Tigers had a 19-0 lead which they took into halftime. The Tigers scored in the opening seconds of the second half to take a 25-0 lead. The kick was good for a score of 26-0. Irrigon took the kickoff to their own 32 yard line. On the first play from scrimmage wide out Brad Test was injured and play was suspended while awaiting the ambulance and the work of EMTs. Following resumption of play Irrigon quarterback Jesus Munoz had a couple nice runs. Unfortunately a fumble killed the Knights drive on their own 38 yard line. Stanfield had a couple runs up the middle for a handful of yards. 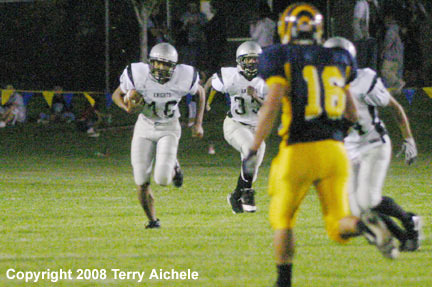 Then Grogan handed off to Josh Grabeel on a 17 yard run to the right for a touchdown. The extra point was good to give the Tigers a 33-0 lead. The Knights took the kickoff and put together a nice series of plays including runs by Dakota Woolsey and Giles Ellett. The Knights made it all the way to the Tiger ten yard line when they fumbled the ball. Stanfield brought in junior Mario Madrigal to take over the quarterback position. DJ Scott had a big run to the 21 yardline. A slanting run by Markus Williams took the ball to the two yard line. on the next play Madrigal handed off to Williams for the touchdown. The extra point was missed but Stanfield had a 39-0 lead with 2:18 to go in the third quarter. In the fourth quarter the Knights took possession at 7:16 on the 40 yard line following a punt by Stanfield. 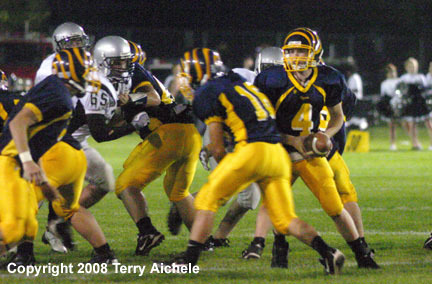 The Knights were sitting first and ten on the Tiger 20 when a runner broke free for the endzone and a touchdown. The two point conversion was good giving them 8 points. The Tigers took the kickoff to their own 24 yard line. At second and five Madrigal handed off to Williams for a 25 yard run. The Tigers had a second and twelve on the 46 of Irrigon when Madrigal again went to Williams who ran all the way for a touchdown. The extra point was good to give the Tigers a 46-8 lead. Following the kickoff to Irrigon a Knight went down with an injury once again requiring an ambulance run. After several minutes the announcement was made that due to the late hour, and since there was less than two minutes to play and the injury timeout would delay the game even further the coaches and officials to call the the game as it was at the time of the injury. The final score Stanfield 46 and Irrigon 8. 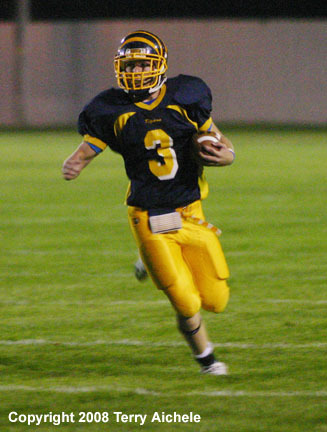 LEFT - Stanfield running back Josh Grabeel on one of his runs during the second quarter. 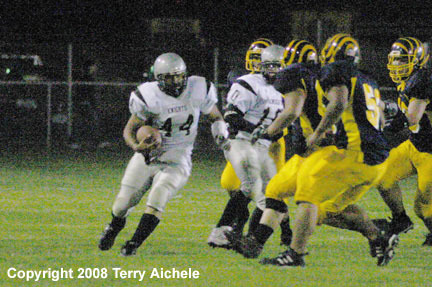 RIGHT - It was a tough game for Irrigon quarterback Jesus Munoz. 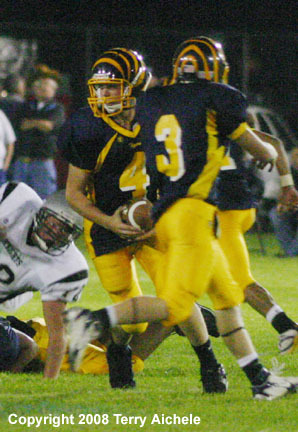 LEFT - Stanfield quarterback Quinton Grogan looks towards the line while Josh Grabeel runs around him. RIGHT - Tiger quarterback Quinton Grogan keeps the ball after Markus Williams ran past him. LEFT - Stanfield quarterback Quinton Grogan rolls out to pass. RIGHT - Irrigon tight end William McBride in the slutches of a Stanfield defender. 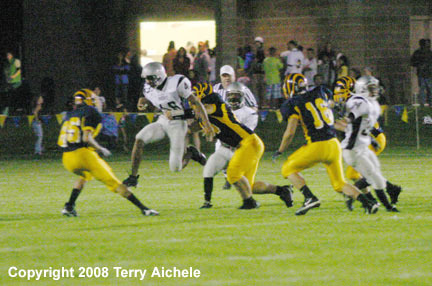 LEFT - Irrigon end William McBride running in the open during the Friday night game against Stanfield. 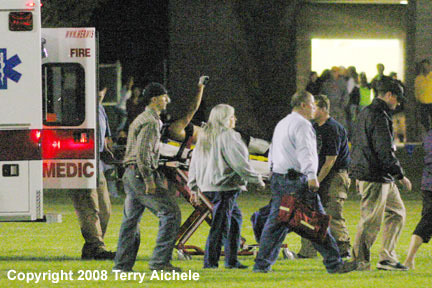 RIGHT - Irrigon junior Brad Test waves to his fans as he is loaded into the ambulance Friday night. LEFT - Irrigon quarterback Jesus Munoz on a keeper around the right end and straight into a wall of Stanfield defenders. 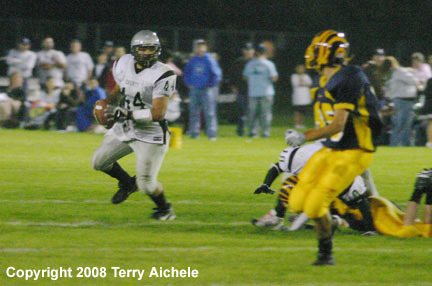 RIGHT - Irrigon quarterback Jesus Munoz rolls out to his right to throw a pass.